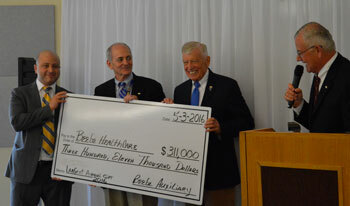 During its annual meeting on Wednesday, May 3, the Beebe Auxiliary presented its largest annual gift to Beebe Healthcare. The donation of $311,000, will be used to fund a new Cardiac Electrophysiology Lab at the Medical Center in Lewes, planned for fiscal year 2017. Auxiliary President Wendell Alfred presented the check to Jeffrey M. Fried, FACHE, President and CEO of Beebe Healthcare, The Honorable William Swain Lee, Beebe Board Chairman, and Dr. Firas El-Sabbagh, Medical Director of Cardiac Electrophysiology. “Every patient is a VIP in the cardiac unit and it makes us proud to know that we can help provide this service at Beebe so that members of our community do not have to travel for this important medical treatment,” said Dr. El-Sabbagh. Beebe Auxiliary is celebrating its 80th anniversary this year. 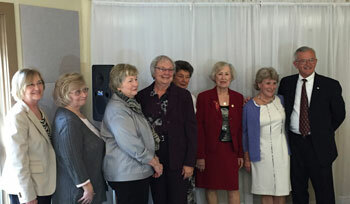 During the course of those 80 years, the Auxiliary has donated more than $5 million to Beebe Healthcare. Each year at the luncheon, the Auxiliary recognizes individuals who have given great support to Beebe and to the Auxiliary. This year, Janet Zary of the Beebe Healthcare Print Room was recognized for her dedication and support of the Auxiliary. Ms. Zary is retiring in June, but plans to volunteer for the Auxiliary in the future. The Auxiliary also welcomed its newly elected officers for 2016-2018. The new officers are: Nancy Tartaglione, President; Lesley Nance, First Vice President; Nancy Almacy, Second Vice President; Patricia Sandy, Treasurer; Lester Levin, Assistant Treasurer; Rosey Vanderhoogt, Recording Secretary; Eileen Thompson, Corresponding Secretary; and Patricia Barry, Member-at-Large. Check Presentation: Shown accepting the check from Beebe Auxiliary (left to right) are Dr. Firas El-Sabbagh, Medical Director of Cardiac Electrophysiology at Beebe Healthcare; Mr. Jeffrey M. Fried, FACHE, President & CEO, Beebe Healthcare; The Honorable William Swain Lee, Chairman of the Board of Directors at Beebe Healthcare; and Wendell Alfred, outgoing President of Beebe Auxiliary. New Board: The new Beebe Auxiliary Officers for 2016-18 (left to right) are Nancy Tartaglione, President; Lesley Nance, First Vice President; Nancy Almacy, Second Vice President; Rosey Vanderhoogt, Recording Secretary; Eileen Thompson, Corresponding Secretary; Patricia Sandy, Treasurer; Patricia Barry, Member-at-Large; and outgoing President of the Beebe Auxiliary, Wendell Alfred.